On September 26, in New York, the U.N. General Assembly hosted a first ever high-level meeting (HLM) on tuberculosis under the key theme – “United to end tuberculosis: an urgent global response to a global epidemic”. The purpose of the meeting was to provide a platform for high-level leaders to reaffirm their commitment to accelerate efforts towards the goal of ending the TB epidemic by 2030. Up to 40 Member States, represented by heads of state, health ministers, parliamentarians and city mayors, attended the meeting along with leaders of civil society organizations, TB survivors, business and research organizations, international development agencies and donors such as WHO, UNICEF, the World Bank, the Global Fund to Fight AIDS, TB and Malaria, UNITAID, and the Bill & Melinda Gates Foundation, among others. The main outcome of the HLM was Member States’ endorsement of the ‘Political Declaration on TB’, committing them to greater efforts and investments towards the Sustainable Development Goals’ target of ending the TB epidemic by 2030. The resolution calls for increased political commitment at the national, regional and global levels, and for increased investments in TB programs, research and innovations, with ambitious targets to treat up to 40 million patients by 2022 and mobilize sufficient and sustainable financing to enable timely prevention, screening, diagnostics, treatment and care for all people affected by TB. The declaration states that “while the World Health Organization declared tuberculosis a global emergency 25 years ago, it is still among the top ten causes of death worldwide”. Although all UN Member States have already committed to end TB by 2030, through their endorsement of the “End TB Strategy” adopted at the World Health Assembly in 2014, progress in the fight against the disease has been slower than hoped, making the 2030 target, which is aligned with the Sustainable Development Goals, difficult to attain. 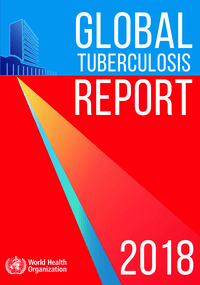 This was confirmed by WHO’s latest annual Global Tuberculosis Report, released on 18 September 2018, in time for the High Level Meeting. The report states that 1.6 million people died of TB in 2017 (including 300,000 deaths among HIV-positive people) while the annual financial gap in financing treatment and services for TB was estimated at $13 billion. Drug-resistant TB is already a public health crisis and a rising threat, with almost half of drug-resistant tuberculosis cases, the TB report says, found in three countries: India (24%), China (13%), and Russia (10%). The meeting included a plenary segment for general discussion and two multi-stakeholder panels on how to scale up efforts to improve access to treatment and prevention services and financing and process, research and commitment to innovations. Commit to decisive and accountable global leadership, including regular UN reporting and review. The director-general of WHO was requested to develop the Multisectoral Accountability Framework by 2019, to measure progress against targets. The U.N. Secretary General, with support of the WHO, will commission progress reports at national and global levels for 2020. 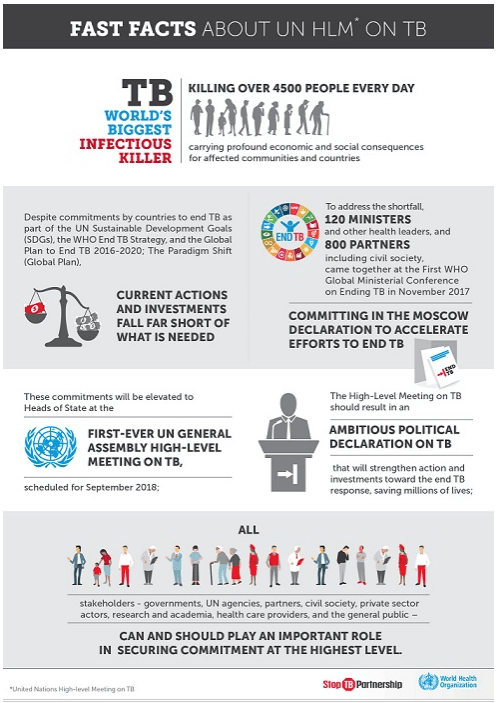 The next high-level meeting on TB, planned for 2023, will provide a comprehensive review of results. Since 2002, the Global Fund has invested more than US$6.2 billion in the fight against TB and now represents about 65 percent of the international funding response to TB.